For adults, it’s easy to forget that getting used to riding a bus doesn’t come overnight. We’ve likely done it countless times by our adult age, but when you’re a child, your first time can be overwhelming. It’s a totally new experience, and it’ll likely come with a school bus. There are simple steps you can take to make your children more comfortable riding the school bus. In the days leading up to the first school bus ride, it could help to act out a fake bus ride with your child so they can see what the real thing could be like. You can do this reenactment with dolls or stuffed animals using chairs from your home. Another good method is to read children’s books about buses, to show that they’re fun, and exciting! Think of the Magic School Bus or something of that nature. We’ve always personally liked this step. A tried-and-true method to calming your child’s nerves before their first school bus ride is to do a ride-along along the expected route. Take them on the path that they’ll be seeing each morning and afternoon. Point out landmarks—like parks, or playgrounds—and then, ultimately, the school. This will orient your child and show them that the ride can be an adventure. And last but not least, it’s worth interacting ahead of time with the children that will ride the bus with your child. Set up playdates or outings to the playground; that way, by the time the school bus arrives, they’ll know that their friends will be on the bus, too. This makes riding much, much easier. 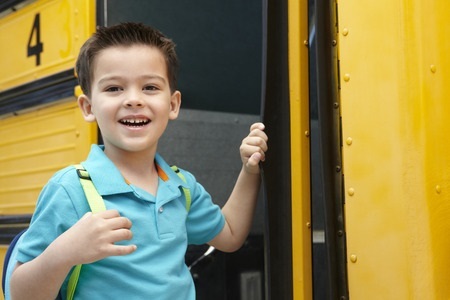 With these tips in mind, your child will not only be comfortable on the school bus, but also, excited to ride it each day! Las Vegas Bus Sales is committed to being the largest provider of, and your best option for purchasing, new and used buses, contact us today!